Instead of focusing on one specific area of the project this week, I have gathered together a variety of smaller Diamond T parts that have not yet been mentioned in the previous update posts. 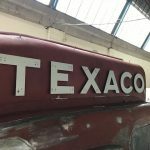 The mounting of the large TEXACO letters along each side of the tank body involved using an adjustable fixing system. 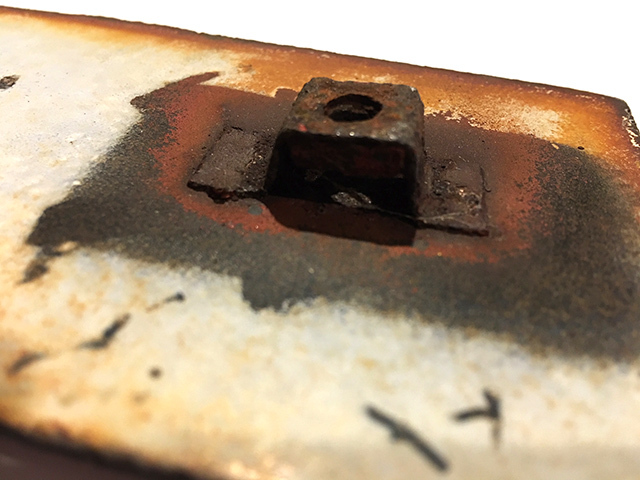 Several standoff brackets were welded on to the tank body for each letter, with nuts encapsulated inside the brackets. A lot of these brackets were leaded over suggesting that Heil probably mounted the lettering in their factory. Corresponding standoff brackets were then welded to the back of each letter, with nuts also spot welded inside these brackets. The two brackets were connected by a threaded stud, with the longer section being a left hand thread and the shorter section being a right hand thread. 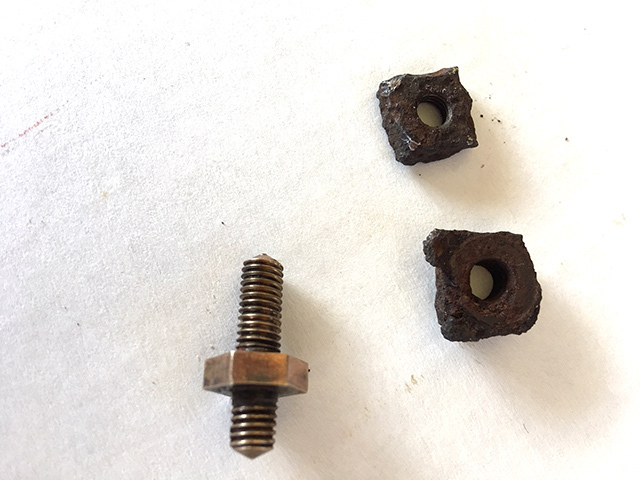 The stud was screwed in to the letter nut first using the left hand thread, and then connected to the tank body nut by the right hand thread. 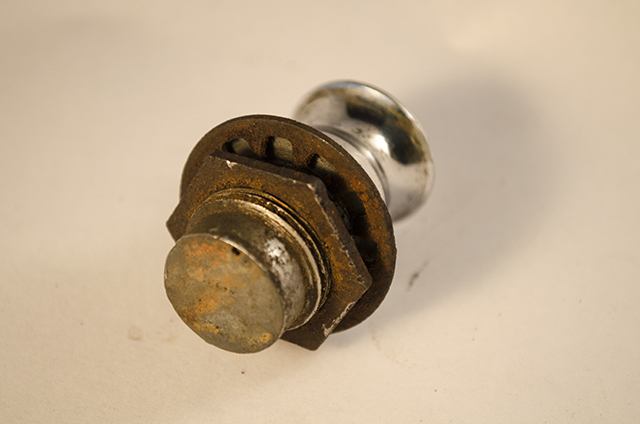 Once engaged on the tank body, the nuts were tightened up by turning the hex nut on the threaded stud. This technique pulled the letters closer in to the tank body and allowed for them to be adjusted until they were perfectly aligned. We are going to preserve this mounting system that was developed back in the thirties and used by Heil and Texaco on the Diamond T tanker. 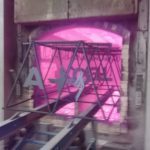 As the replacement letters will have to have the standoff brackets welded in precisely the same place, it will make the fitting of the letters back on to the body a slow, arduous process. 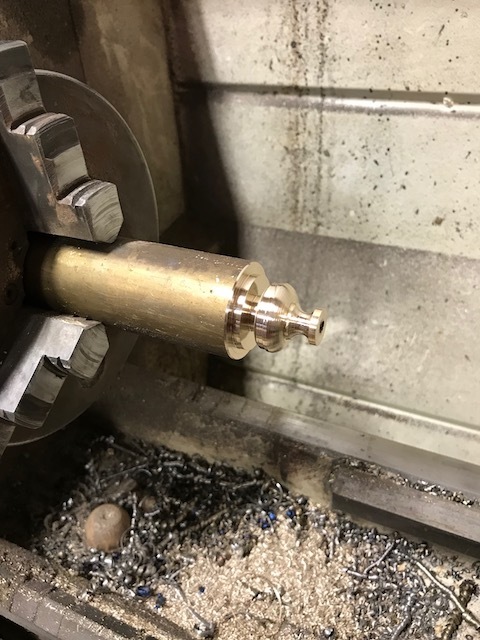 Steve is getting more double threaded studs CNC machined to replace any that were damaged or cut when the letters were initially removed from the body. The first thing that Steve noticed when he looked at the wiring loom behind the dash was the back of the cigarette lighter. The lighter had no wiring to it at all and had been blanked off at the back and welded. It is only supposition on our part, but we suspect that this was done from a safety perspective to disable the lighter’s functionality permanently. Logically, it would have been done at the Heil factory when the Diamond T was being modified to serve as a tanker. 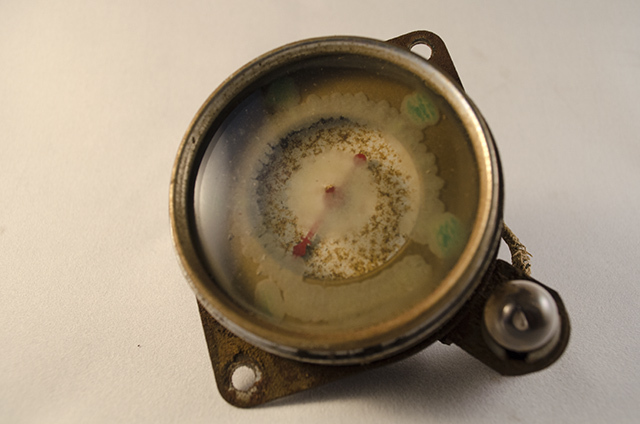 Steve has now removed the six gauges from the instrument panel. With the exception of the clock, the remaining gauges have the manufacturer’s name, Stewart Warner, engraved on the back of the casings. 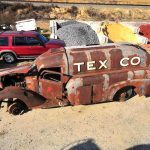 Stewart Warner was founded in 1910, and is yet another company in the U.S. involved with the 1938 Texaco tanker that continues manufacturing today. Despite the severe deterioration of the graphics in the gauges, we can still determine the original colour scheme. We initially thought that the graphics were screen printed on the inner brass bezel. 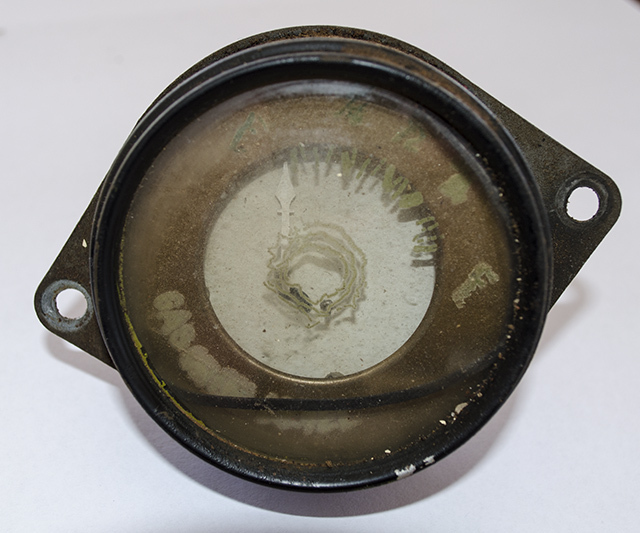 But after dismantling the gauges, we have found that reverse printing has been applied directly on to the back of a circular sheet of glass that is mounted in the inner brass bezel. This gives the impression that the printing has been applied directly on to the brass bezel itself. 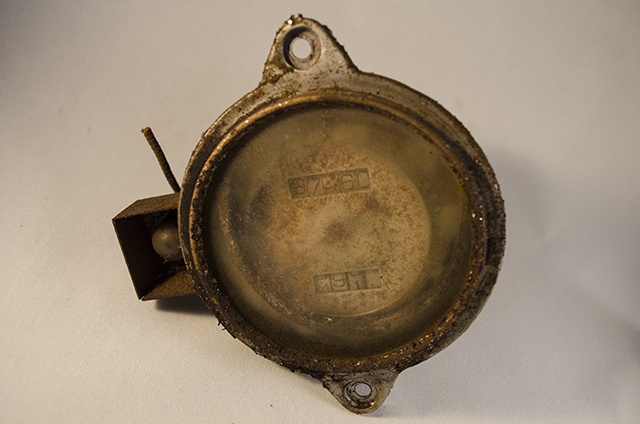 The small cut out in the glass just above the plus sign on the right hand side locks into the inner brass bezel. The ink has degraded and bled so badly, it has become distorted and is illegible. 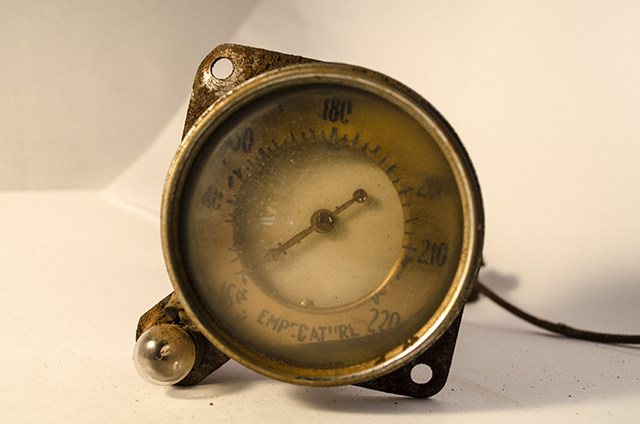 The glass in this image is out of the ammeter and the word at the bottom should read AMPERES. The centre marking was three rings, and all the graphics were originally green. Cut in to the side of each gauge casing is a slot which is covered in plastic. The gauge faces are illuminated through the slots from a borrowed light source behind the dash, and from bulbs that are attached to three of the gauges. 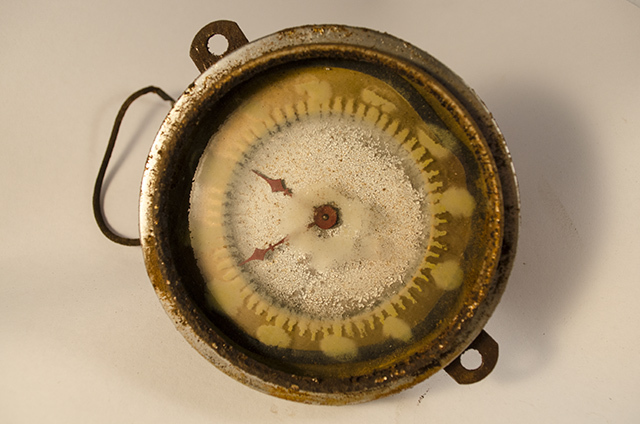 The following images show the six gauges in their present condition. Mitch Keys from Electric Creative Ltd will recreate the artwork for each gauge. We fortunately have access to another Diamond T truck which is a different model but the gauge styles are identical. There is still enough detail on some of these gauges to steer Mitch in the right direction with regard to the font style, size and markings. 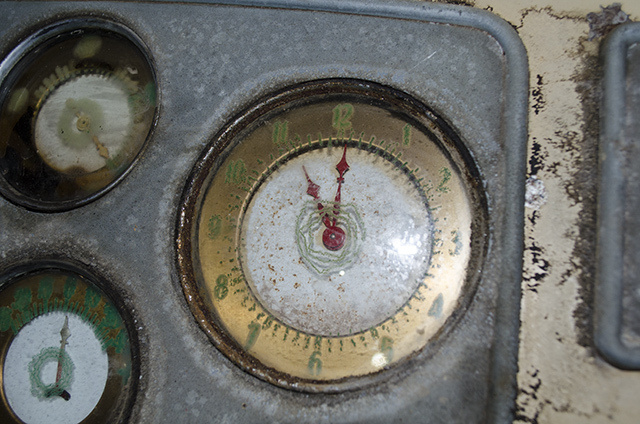 This ammeter is in better condition than the one in the tanker but still illegible. 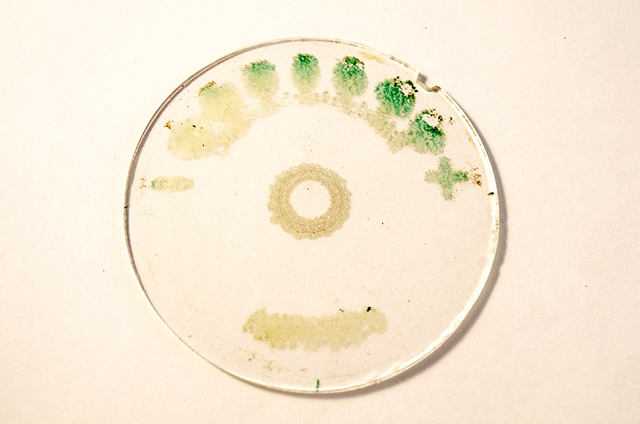 Unlike our gauges, the ink on this one has retained the rich green colour. 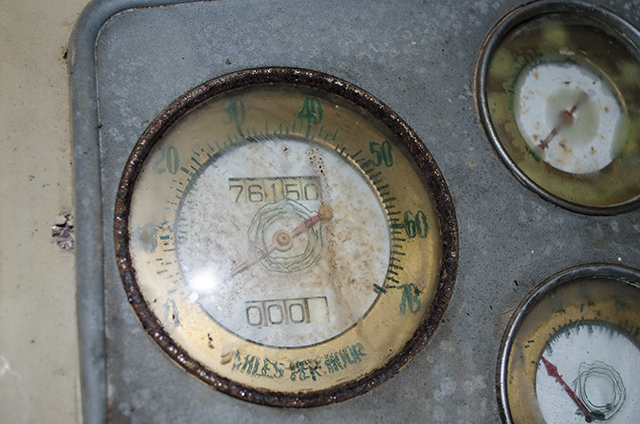 The speedometer will be very helpful to Mitch when recreating the artwork on the tanker gauges as the numerals are still intact. 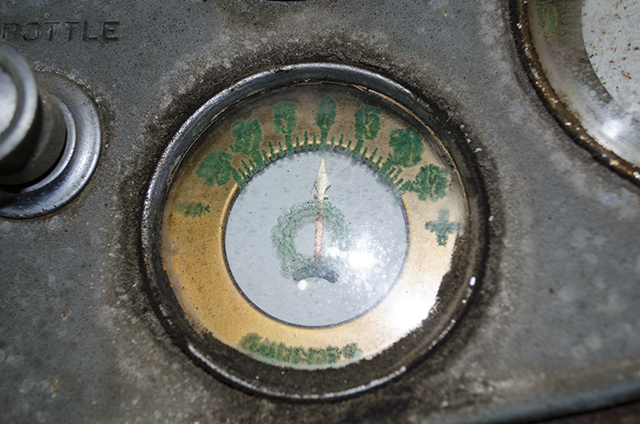 The gauge in the top right of the image bears the same bleeding and degradation of ink as our gauges. 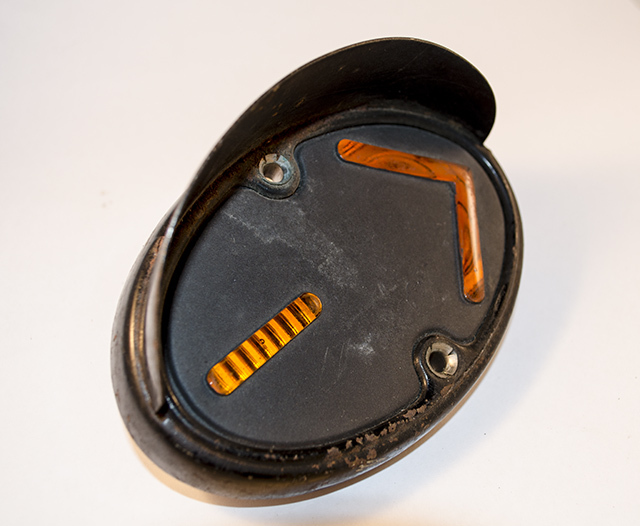 When Steve discovered the two gear shift lever knobs on top of the cant rail, he also found four glass lenses. Thinking that the lenses had no relevance to the tanker, Steve initially threw them out in the rubbish. 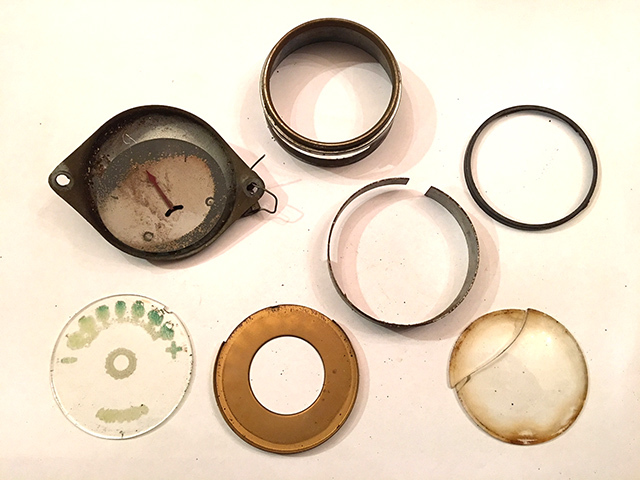 But when he mentioned finding them, I asked him to retrieve them “just in case” they did relate to the operation of the Diamond T.
A coating has been applied to the rear of each lens. 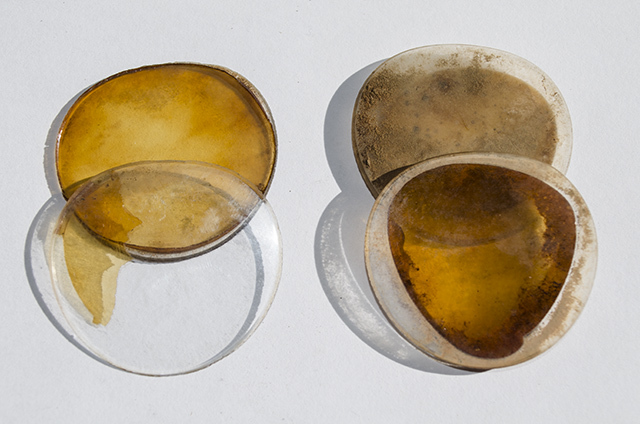 All four are in varying conditions and the coatings on the two front lenses in the following image have lifted and curled. 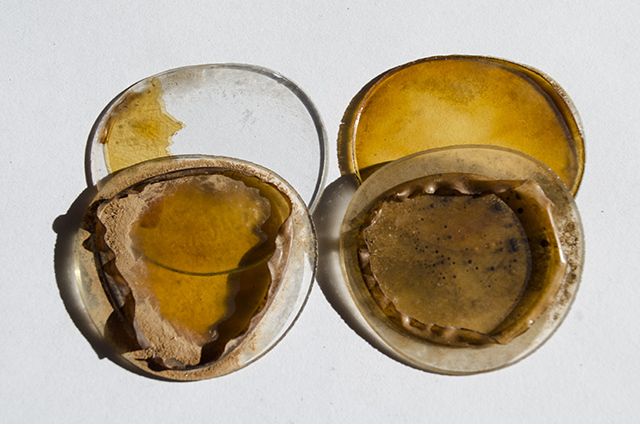 These little pieces of glass have stirred up several discussions with friends, with suggestions being put forward on their uses. They may have no relevance to the Texaco tanker whatsoever but someone placed them in the roof cavity a long time ago and they might just be part of the Diamond T story. Any other thoughts or suggestions are welcome! 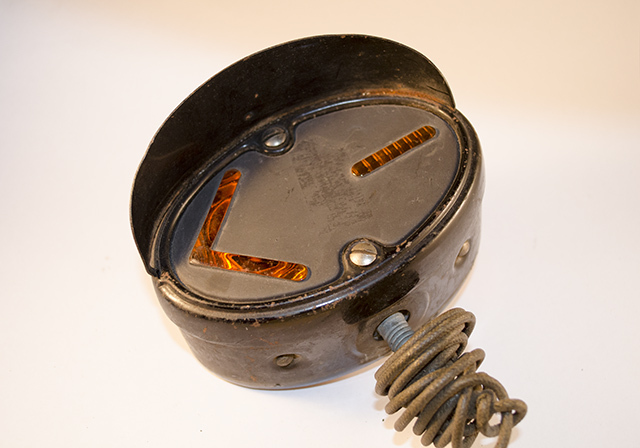 The steps in the tank body are accessed by opening the small covers on each side at the front using a round handle. Only one handle remained with the tanker so Steve recently machined another one out of brass. We mentioned a few months ago that we were looking out for some hard to find turn signal lenses. Our good buddy, Chris ‘Starry’ Malcolm, from Northern California took up the challenge. After a lot of searching, Chris found a pair of the exact lenses that we were looking for. As an added bonus, the pair of lenses came complete with the bezels and eyebrows for the rear turn signal lights. A very, very good find! Around the same time, Steve ordered some replacement rubber items from Tom Warren at the Diamond T Rubber Company in Amarillo, Texas. 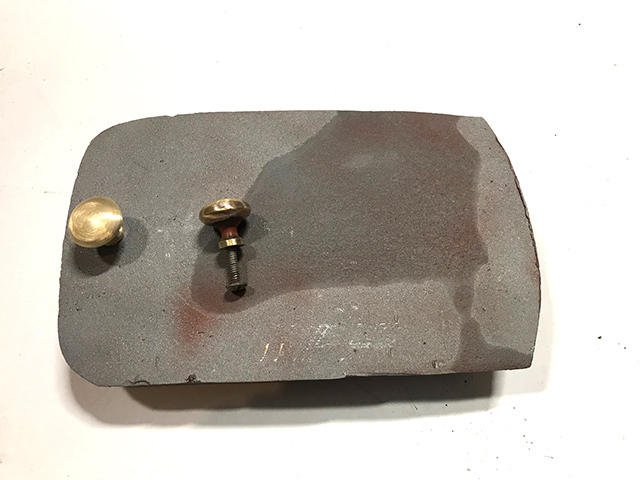 Chris Malcolm’s wife, Linda, was returning to New Zealand for a few days last month and kindly offered to bring the rubber parts back with her along with the turn signal lights. 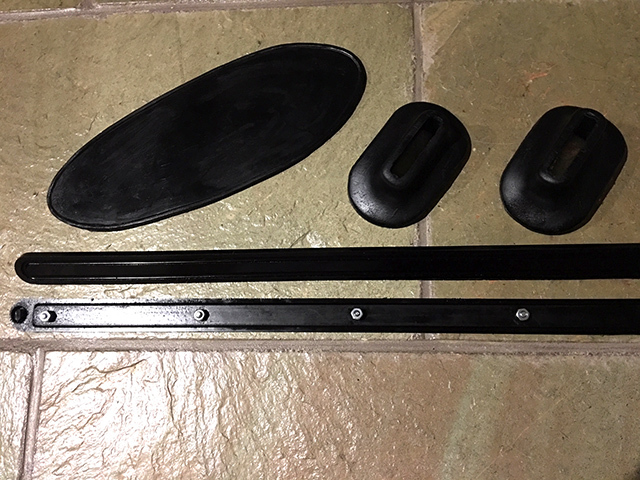 The definition of a true friend is someone who is heading to a winter climate but forgoes some of their warmer clothing in order to fit Diamond T parts and rubber pieces in their suitcase! 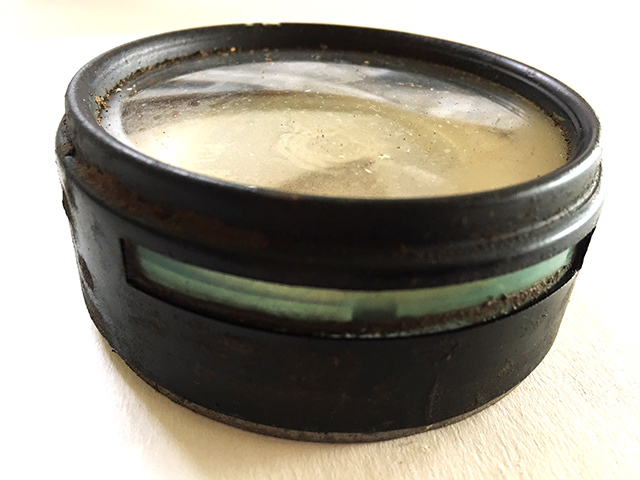 Our thanks and appreciation to Chris and Linda for helping us source the rear lenses, for delivering the said lenses in one piece as well as the rubber parts, and for all the emails and phone calls of support with this project. 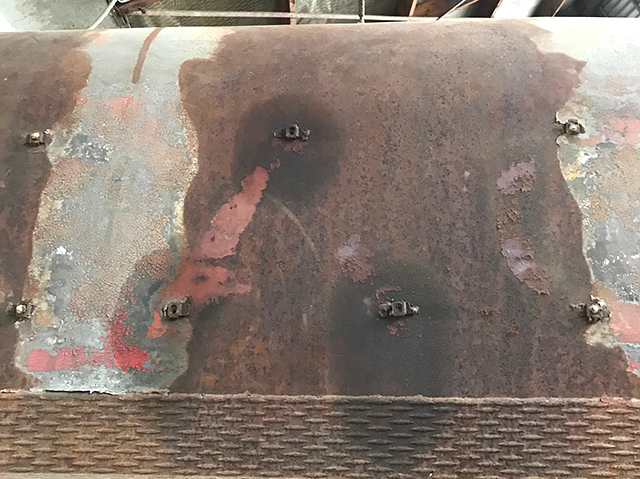 So often these smaller details of a restoration are left unexplained – this is such an interesting build and a history lesson all in one. Thanks for sharing. 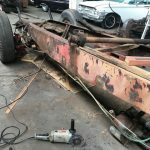 I am aware that some people following the blog have never been involved in vehicle restorations from this era. 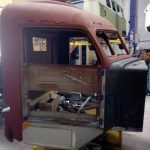 I am trying to add lots of detail in the hope that everyone will appreciate the innovation and craftsmanship that went in to this truck and tanker, and also understand the technology and vehicle construction of the thirties. Thanks Justin. Remember, Nostalgic Reflections can re-make the instrument faces, as well as most anything. Excellent resto and lots of work ahead. You guys seem passionate. ill keep following and will see if I can help out in any way. That sounds great Gary, thank you.